Murari Gupta was a physician living in Navadvipa, West Bengal, India, during Chaitanya Mahaprabhu's pastimes in the early sixteenth century. Murari Gupta was a loyal devotee of Lord Ramachandra, and participated in many events in Mahaprabhu's early life. His spiritual and professional qualifications enabled him to help his patients physically as well as spiritually. Murari Gupta is considered an incarnation of Hanuman, the eternal servant of Ramachandra. 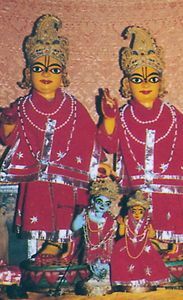 Image shows Murari Gupta's Deities of Chaitanya and Nityananda. - from the Chaitanya Charitamrita, Adi-lila 10. 49-51.